It’s been a couple years since my last visit to the Living Desert Zoo and Gardens in Palm Desert. I usually avoid heading east away from Los Angeles. There’s something about the desert that just doesn’t agree with my psyche, but this recent excursion couldn’t have been more enjoyable. The weather was perfect (sunny and cool) and the animals were moving about. My friend and I arrived just as the park opened and headed for the hillside where the Bighorn Sheep clatter about. It was feeding time and the sheep moved from place to place finding feed left by the zookeepers. 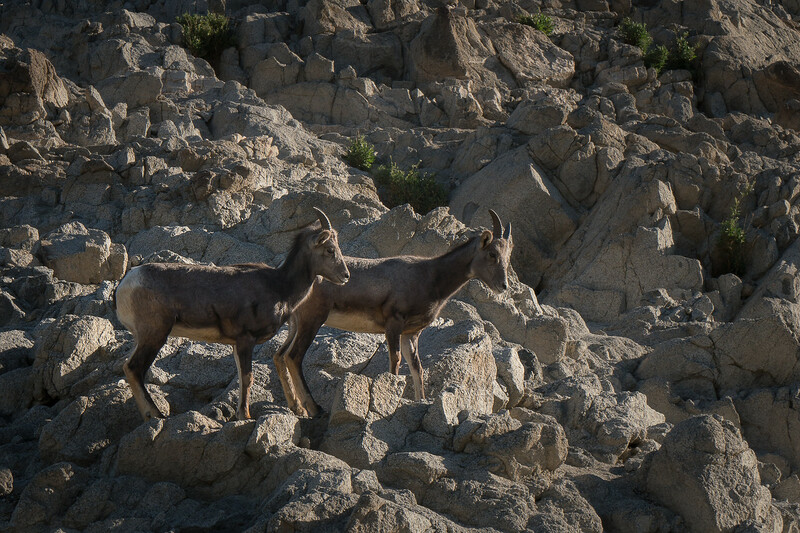 Their dusky coloring blends in with the desert rocks and from a distance, they’re difficult to spot. We spent far too much time trying to coax these critters down from the top of this hillside. Eventually, we moved on to the jaguar. Big cats are always exciting. They also are kept behind filmy, reflective glass. I suppose I should be happy about that. I wouldn’t want to find myself standing a couple of feet away from a jaguar. 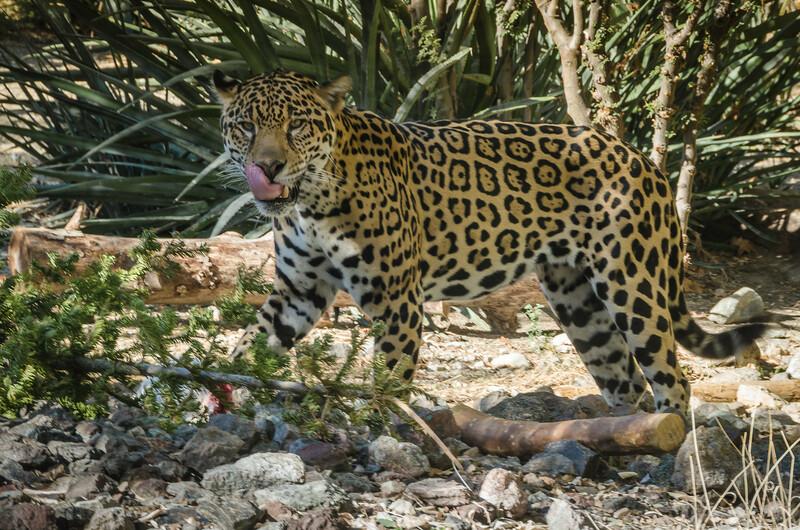 I did manage to find a relatively clean corner of the window just before the jaguar was released and allowed to prowl about searching for its “snack.” I’m not sure what he found, but he did enjoy it. Predators need prey. We saw plenty of sheep, antelope, and gazelles. 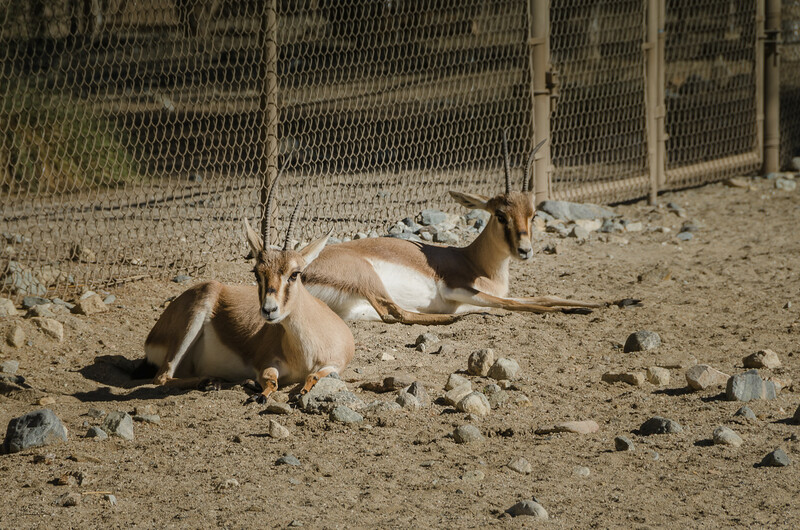 According to a nearby sign, these Saharan animals are on the endangered list. There are only about 500 left in the wild. That’s a shocking statistic. The main threat is poaching. Not all preditors are big cats. In this case, man is the problem. Speaking of big cats, a special attraction has been added since my visit a few years ago. The Living Desert now has a cheetah run. I was somewhat apprehensive that this would be impossible to photograph. The cheetah would zoom past and at best I would get a picture of its tail. I so glad I was wrong. We arrived at a viewing spot about twenty minutes before the scheduled run. It’s always good to be in front when trying to get a photo. 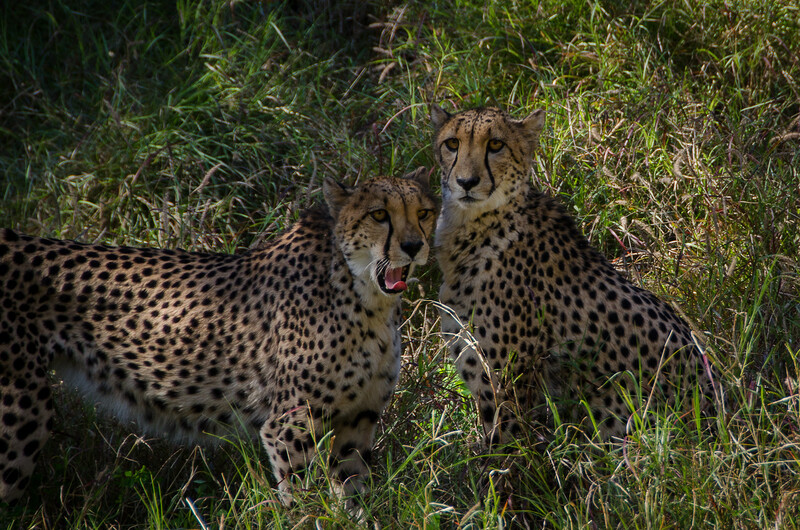 The cheetahs, three of them, knew the drill and were pacing about waiting for things to get underway. Cheetahs wait for the Run to start. 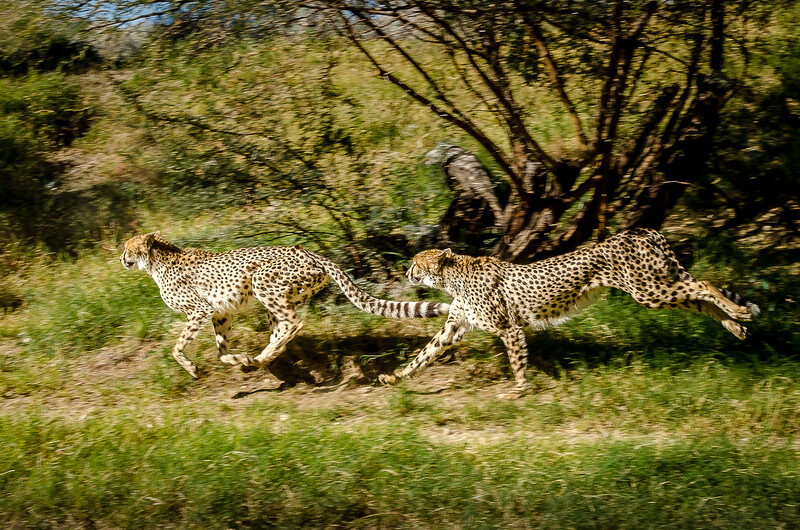 Once the time came, all three cheetahs ran up and down a dirt path, passing all the viewing areas. At the end of each run, they received a reward from a trainer. We had plenty of opportunities to get a picture. They ran by quickly but it wasn’t a zoom! These cheetahs were clever. They knew they didn’t have to go all out to get the food. I really enjoyed the above addition to the park activities. I felt that during this visit I saw more animals, different animals. One of these new finds was the Mexican Wolf. Did I simply miss seeing it a few years ago? Well, I saw three wolves on this visit. They were busy chasing each other around the canyon-like terrain. We, the viewers, were safely behind some fencing. I managed to find a spot near a corner where I could peek over the fence! I had never heard of a Mexican Wolf before. Now I know that this is a subspecies of the gray wolf and critically endangered. It was virtually wiped out in the United States in the late 20th century. 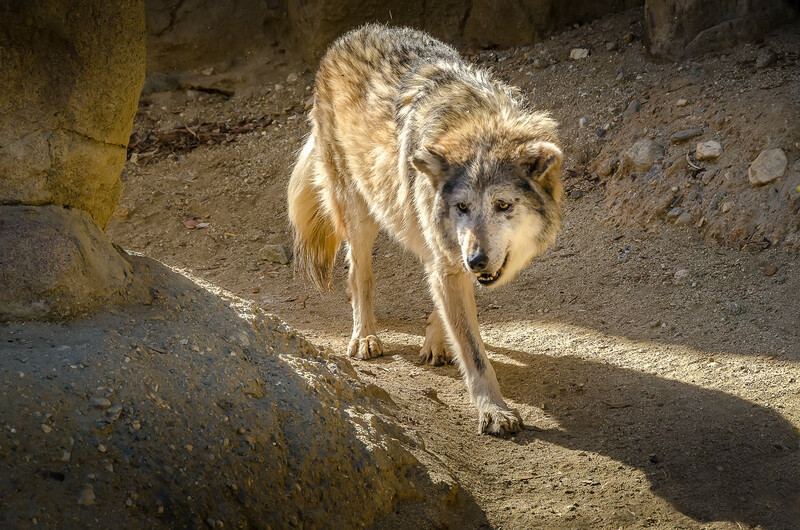 According to the Center for Biological Diversity, only about 100 wolves were discovered in the wild in 2017. Another shocking statistic! I had a great time at the Living Desert Zoo and Gardens. Did I see everything? Of course not. I’ll have to make another trip. This isn’t far from Greater Los Angeles and certainly close to Palm Springs. There are lots of attractions besides the predators mentioned above. Birds, reptiles, and even a G-scale model railroad are on hand. There’s a shuttle service as well for those who get tired of walking. A one-time fee will give you all-day access to the shuttle. Near the entrance is a self-serve cafe. The food was good…and healthy. Such a pleasant change. 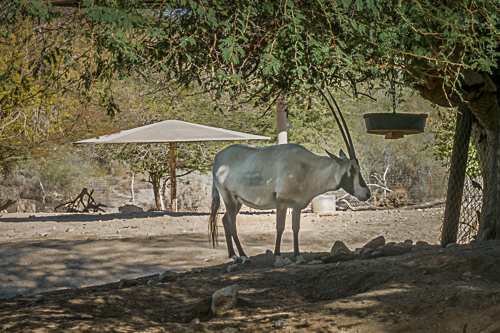 If you would like to see more images from my trip to the Living Desert, please click here.